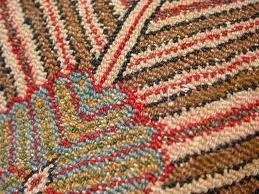 Weaving of lost end border of an antique Persian Bijar runner by me. The whole wide border is being restored. I will discuss this repair in the coming posts. Keep in touch! 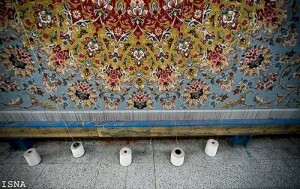 I thought to post these pictures showing a unique humungous Persian rug in the process of production and weaving. Note the large loom! Each weaver will have a piece of map for the section in front of her. Imagine the extreme attention to coordinate the small sections of maps to exactly fit together and the overall design. 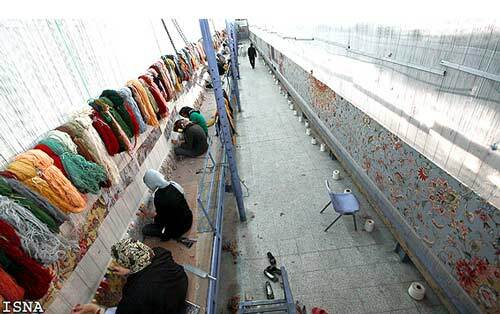 Weavers would also make artfully and skillfully check with each other so the don’t mismatch lines,rows,colors,etc. I humbly bow to the craftsmanship! 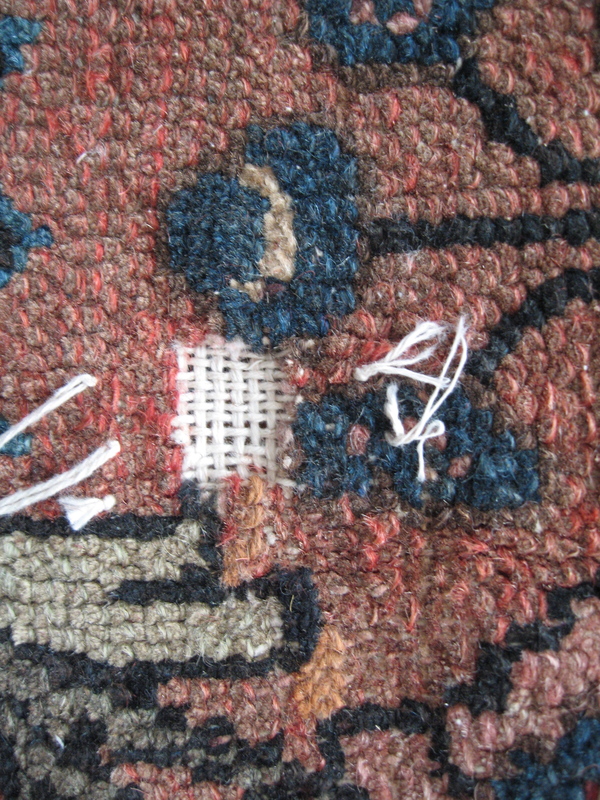 By DrRug | Filed in Handmade Rug Repair | No comments yet. I started in previous post talking about repair on a Persian Heirz rug. 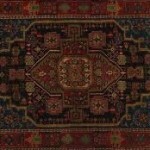 I am going to write more about this type of rug, rugs of that region, and their structure. Heriz is a famous and very popular rug, and you need to know more about it. I hope you don’t get bored. Let me know what you think. Heris is located in East Azarbaijan, Iran. About 40 miles east of Tabriz- capital of east Azarbaijan. 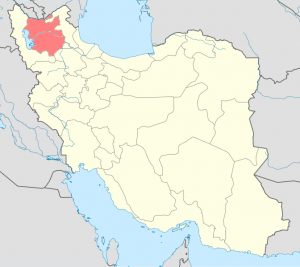 Azarbaijan provinces – east and west- are located in north west Iran. A big chunk of Azarbaijan was separated from motherland Iran in 1828. Hopefully it will be reattached to motherland someday. Here are maps of East Azarbaijan, and Heris. 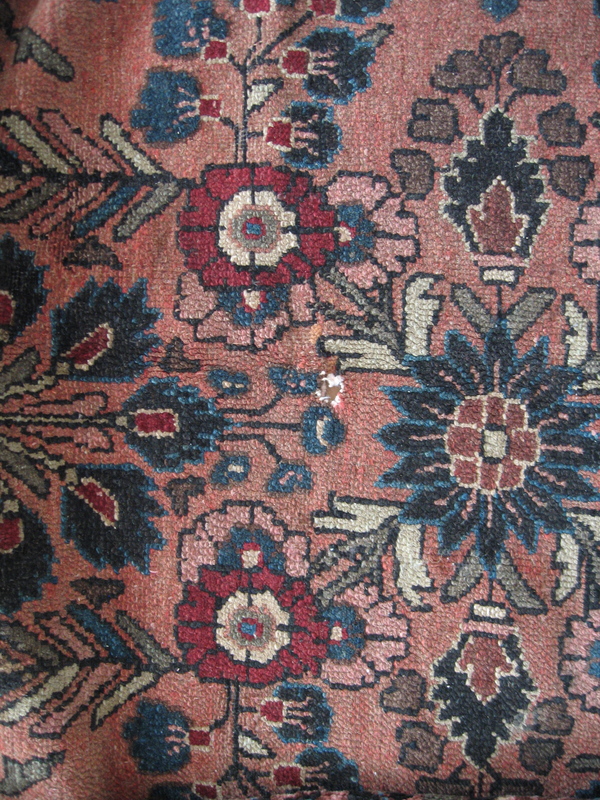 In this post I’ll talk about a Persian Heriz rug that I repaired. On the side I talk about Heriz rugs. First let’s talk about the rug and what happened to it.. This rug had a water rot on the side border. A fairly large circle with about 1 ft diameter. When you pulled on that area, it would separate. Water rots are very common damage that happen. Main cause is rots under plant pot. Usually the plate under the plant pot cracks and leaks or you over water the plant every now and then. This small amount of water- and the minerals in it- do their job in the long run! One day when you move that plant for some reason you notice a dark circle where that pot was. Other case of rot happens during storage of rug in wet areas and contact with moist concrete. 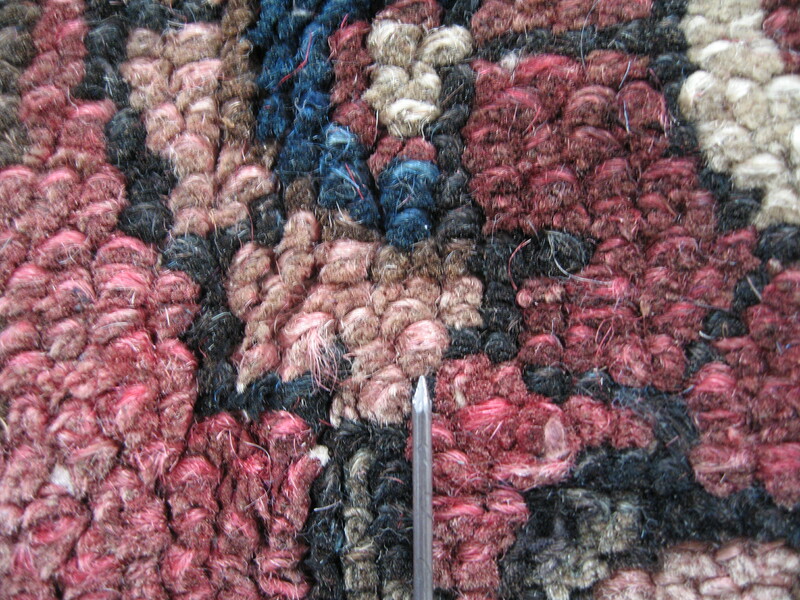 When you try to pull or poke it, that section of rug may separate depending on the length of the time it was exposed to water. At this point that section needs to be rewoven. That’s what happened with this Heriz. I cut and removed that piece as you can see in the picture. Usually I have to remove and cut a larger area than the actual section to get to a clean and strong edge. This margin is even bigger in the case of water rots. Water can penetrate few more inches into the rug out of actual rot circle. Back to our BibikAbad rug for repair. The rug had about 80 years of age. Most of the naps were gone. The damage actually was not a very big one. A hole about 2″x2″. As I said it was not a significant damage- maybe for me!- so I restored the foundation and the rest of the repair. I also post a picture of the knots where you can see the knots are not in line- read the previous post about BibikAbad rug weave texture. In the next post I’m going to talk about another Hamadan rug and it’s repair. Keep in touch! Notice the knots. They are not in one column. Compare the knot over tip of nail with the ones on the row over it. In the last post I talked about Hamadan, Hamadan rugs, and some information about their weave and structure. I have here today a rug for repair from Hamadan. You remember that Hamadan rugs come in lots of different designs mostly named after the name of village, or city they have been woven. This rug here is called BibikAbad. Bibikabad is the name of small city about 40 miles from Hamadan. Same as other Hamadan rugs; Bibikabad is woven using turkish knot and single weft. wefts are thick, and in general they have low density weave texture. BibikAbad rugs have a unique characteristic. Their knotting structure is different from other turkish knot rugs. Here I like to give a brief description of turkish knots. 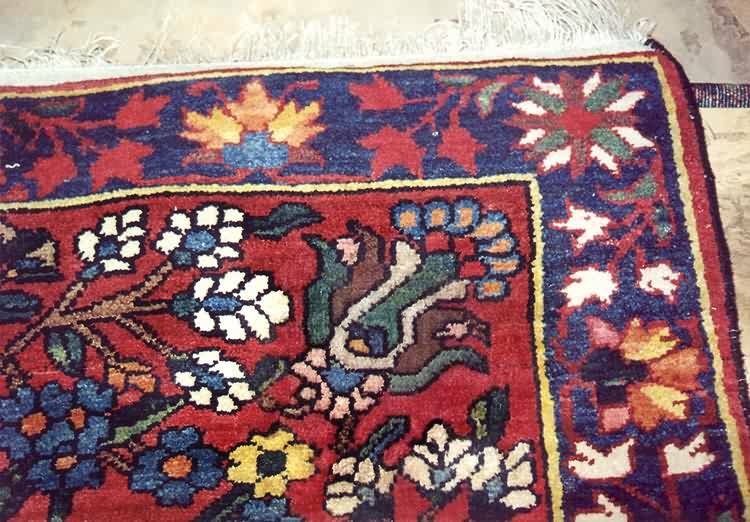 In general handmade rugs are made using persian knot or turkish knot. Since I’m talking about Hamadan -Bibikabad- rug here, I explain turkish knot. 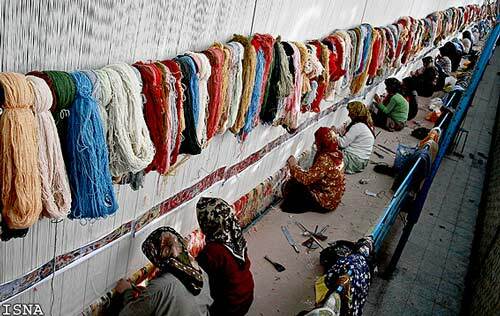 To make a turkish rug, wool is wrapped around two string of warps and both tips come out from between those two warps as you see in this picture. The yellow strings are warps. This is what you see in all rugs with turkish knot. Warps can be silk, wool, cotton as well as the pile. But the structure would be the same. Two warps for each knot. Now back to our BibikAbad Rug. They also have turkish knot, however the unique feature is that the weaver sometimes would use three or even four warps for making a knot. Any combination of 2 warps for left loop 1 warp for right loop, vise versa, or 2 warps to 2 warps. This will make the knots not to align in one column if you pay attention. And also the back of the rug will look full. This covers warps to some extent. This is a identifier for Bibikabad rugs. I am going to write about Hamadan rugs today. One reason I do this is that lots of Persian rugs in the market are woven in Hamadan. Hamadan is a province in Iran with the same name city as capital of the province. It is located in mid western Iran in a mountainous region in foothills of Alvan mountain. 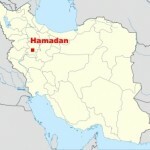 Hamadan is believed to be among the oldest Iranian cities and one of the oldest in the world. According to an inscription from the first Assyrian king, Hamadan’s construction is dated at 1100 BC, but some historians believe it dates back to 3000 BC. It’s ancient name was Ecbatana and capital of Achaemenids. 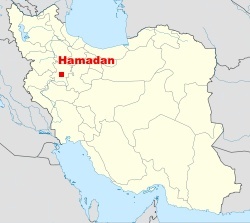 Hamadan is mentioned in the biblical book of Ezra as the place where a scroll was found giving the Jews permission from King Darius to rebuild the temple in Jerusalem. (Ezra 6:2). Its ancient name of Ecbatana is used in the Ezra text. Hamadan is in the vicinity of the Alvand mountains and has a cold, mountainous climate, with snowy winters. In fact, it is one of the coldest cities in Iran. The temperature may drop below -30°C on the coldest days. Heavy snowfall is common during winter and this can persist for periods of up to two months. During the short summer, the weather is mild, pleasant, and mostly sunny. 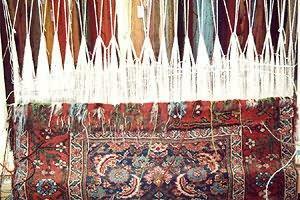 Hamadan as a city and province has long been known for it’s exceptional handicrafts, especially rug making. Carpets from this region incorporate designs from the approx. 1,500 surrounding villages. On average, two distinct designs have been produced from each village, giving an astonishing 3,000 different types of Hamadan rugs. 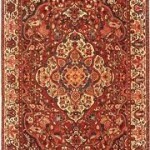 So you’ll see lots of Persian rugs that fall under Hamadan rug category. 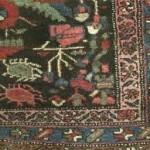 Some famous rugs from Hamadan are: Nahavand, Tuyserkan, Asadabad, BibikAbad. Hamadan rugs are heavy and substantial, they are made with high quality, thick wool. A distinctive feature in Hamadan rugs is single weft. Another identifying feature in Hamadans is a geometric diamond or hexagon medallion pattern, usually with medallion-and-corner design, or all-over boteh or Herati. Common field colors include red, blue, dark brown and camel, with motifs and outlines often in black, green, and gold. 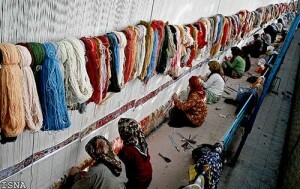 Hamadan rugs are woven using Turkish knots. Once each row is woven on the loom, a thick weft is combed on it and another row is started. Wefts in Hamadan rugs are usually much thicker than warp. If you turn the rug over you’ll see distinctive thick lines of wefts. 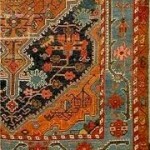 I post some samples of Hamadan rug. As I mentioned above there are about 1500 small cities, and villages around Hamadan, and each has its own type of design. So it’s a very wide variety. 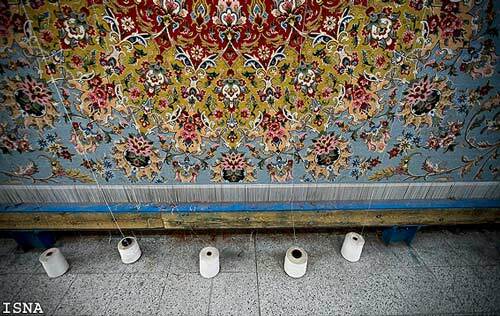 Just one of the reasons Persian rugs are so famous! Each rug is unique; a true work of art. They are not mass produced in factories as they do in China, India, or Pakistan. When you own one, you own a piece of art! 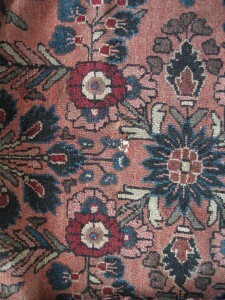 In the next post I will write about a repair of a rug from Hamadan. 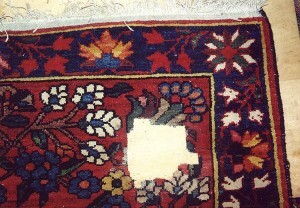 A BibikAbad rug. The regret I have is I was never serious about taking photos and documenting stages of repairs that I did. Until recently that I try to do it. 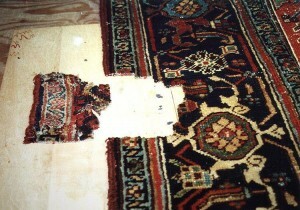 I have repaired lots and lots of rugs, any kind you can imagine and any kind of damage. So all I have from this Bakhtiari repair is the first photo before repair, and then final photo after it’s done. So there you have it. You see the rotten section is restored. Foundation was rebuilt, wools were matched or dyed. Then weaving took place and repair completed. I was very satisfied with the result. Customer was very happy too. Off course I had to pinpoint which corner of rug was worked on as he could not find it! Keep in touch for further repair stories! Now let’s go back to the repair. 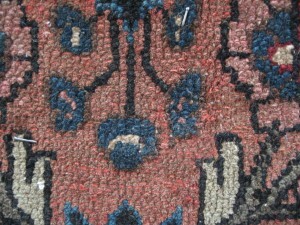 Bakhtiari rugs mostly have coarse weave texture like other tribal rugs in general. They usually have single weft. In short wefts are threads that are placed on top of each row of weave when the rug is being woven on a loom. They are pressed and locked in place by a heavy metal comb. Some rugs have single weft, some double, and to lesser amount some with 3 or 4 wefts. Wefts can be cotton, wool, silk. White or colored. Wefts in Bakhtiaris are usually blue. You remember that Bakhtiaris are tribal population. They use natural elements. 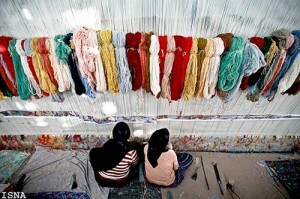 So wool and material used in weaving original Bakhtiari rugs are dyed using vegetable dyes. Wool is obtained from the sheep herd they own. 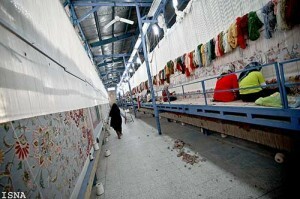 We will in other posts talk about types of weave,warp, weft, etc. So keep in touch. 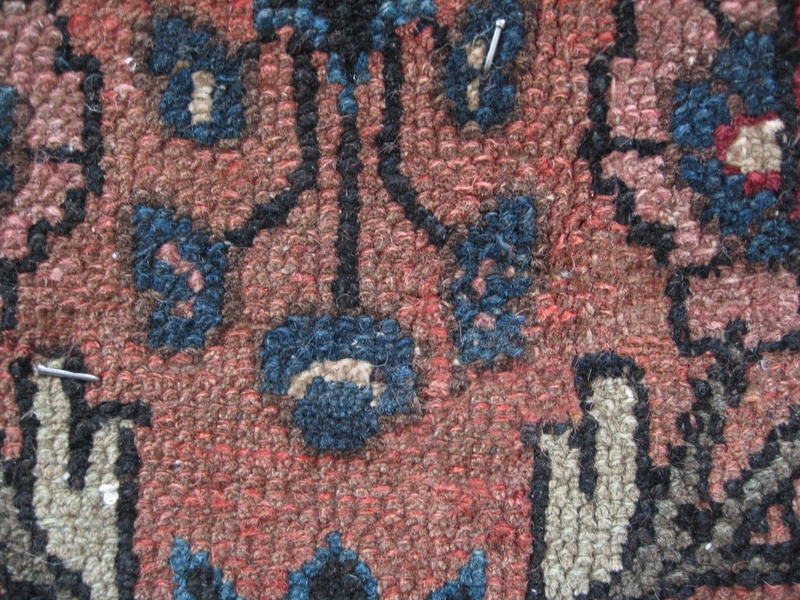 Anyway this Bakhtiari had a very fine weave, rare to see in Bakhtiari rug. I can say it was as fine as medium to high density Tabriz rug. The damage was caused by water leak from a plant pot. Other than this the rest of rug was in good shape. What you see here is that damaged section after trimming those rotten and loose section. I had to trim it back to get to stable and firm margins. The damaged area was relatively large. This was a 10 x 13ft rug and the border was a wide border. If you click on the picture, you’ll see more details. Look at the top where fringe and salvage is. You can notice the fineness of weave. This rug repair project is from sometimes ago. I decided to post it now till I have a rug at hand for repair. 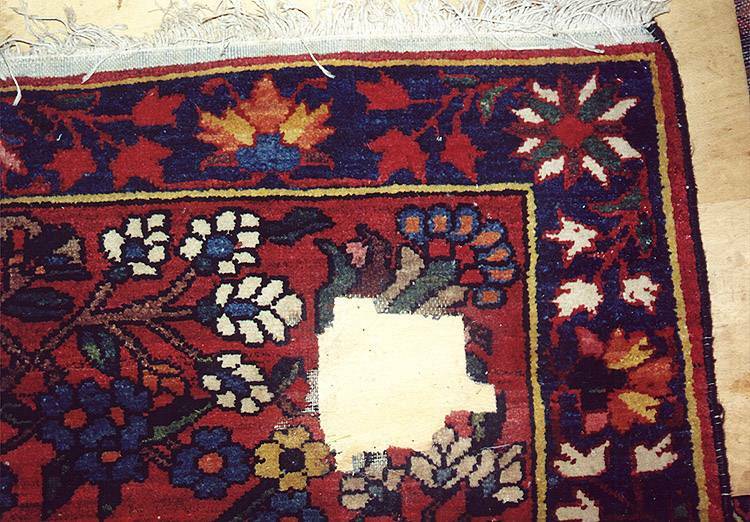 This rug repair was performed on a Persian Bakhtiari rug. As you may know Persian rugs are mostly named after the name of the city, village, tribe, or person, that they are woven in/by. I have here some brief information about Bakhtiari tribe for you. Bakhtiari actually is name of a famous and big tribe in south center Iran (former Persia). They belong to Lur race. 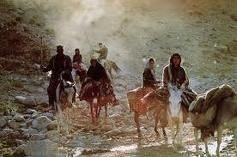 The Bakhtiari tribe, which numbers more than 800,000, inhabits an area of approximately 67,000 sq. km (25,000 sq. mi) that straddles the central Zagros Mountains in Iran. Although only about a third of the tribe is nomadic (the rest are settled agriculturists), the nomads embody the Bakhtiari cultural ideals. They specialize in producing meat and dairy products and migrate seasonally with their sheep, cattle, or goat herds from high plateau pastures, where they spend the summer, west of the city of Esfahan, to lowland plains in the province of Khuzistan for winter herd grazing. 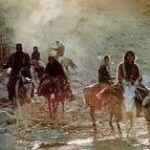 Their migration is among the most spectacular known among nomadic paternalists anywhere. They are obliged to cross mountain passes at about 3,050 m (10,000 ft) and therefore have to time their movement with extreme care in order to minimize the danger of early snowfall, flooding mountain rivers, and lack of grazing. Traditionally these dangers took a heavy toll, but in recent years the government has helped the migration by building bridges, improving the route, and setting up fodder supplies en route. The Bakhtiari’s are the largest and most purely Iranian of all the Persian tribes. They belong to the Lur race and their language is closely related to the oldest known forms of Persian. 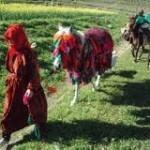 The annual Bakhtiari migration in April from their Garmsir, or winter quarters in Khuszistan, to their Sardsir, or summer pastures in the Chahar Mahal region of the plateau south/west of Esfahan, takes from four to six weeks. It is an epic of human courage and endurance in which men, women and children of all ages, with their animals and household goods, travel by five different migrations routes across some of the wildest and most difficult mountain country in Persia in their search for grass. Will continue with the actual Bakhtiari repair in the next post, keep in touch! Hello everybody. I have been a rug weaver in the past and rug repairman for 25 years. Yes! it’s a long time. Obviously I have worked with many different types of rugs. Mostly Persian rugs. I can’t count for you the number of rugs I have repaired, I never kept a documented record of those projects. Just every now and then if I felt like it, I took some pictures and kept them. For a long time I was still looking at this as just a job and not as a art so I thought I’m just doing a simple repair. I did it the traditional way. Then I started to appreciate it and thought I had to share this with other people. I knew there are lots of people that like to know about repair. Actually this came during the years I was repairing customers’ rugs. They always were amazed at the results- I usually have to show them where the damage was! They wanted to know how I did it. So I said ” let’s share the repair jobs I do with other people who are interested. 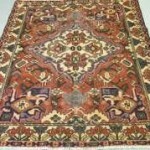 Let’s start a blog about handmade rugs in general, and rug repair in particular”. 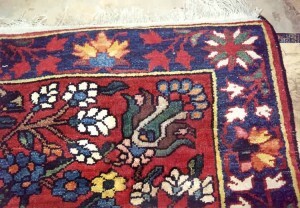 I plan to post for you pictures and some description when I work on rugs. Your comments are always welcome. 39 mySQL queries executed in 0.824 seconds.